Graduating classes of young professionals all over the world are preparing to meet new challenges set before them as the embark on a journey. The lessons and academic content taught in their respective fields of study still fresh in their minds as they interview for that perfect career. Some of them are hoping to solve age old problems and improve the human condition. The Biology and Life Sciences that they have learned in the classroom is now ready to be put to practical use for a worthy cause – discovery. In this new age of emerging personalized medicine, discovery of new characteristics of living cells is what this generation faces. New opportunities to do research that will be the future of treatments. So how will they transport the needed living cells for their research? Researchers need to look at the methods they are currently using for transportation and do a comparison to how successful pharmaceutical therapies (CAR-T cell therapies) are transported. If the goal is to demonstrate a discovery from living cells they must be able to ascertain that the science is reliable because they have eliminated any outcomes due to chance that could be caused by the effects of biologic transportation. Living cells tell us a story about their environment and its effect on the cell colony. When the environment is negatively changed the results can have ramifications. Transportation choices have been scientifically recognized to show these negative results (Mark Sawicki, PhD. The Science Behind Logistics. How Cold Chain Planning Impacts the Clinical Development and Commercialization of Regenerative Therapies.). 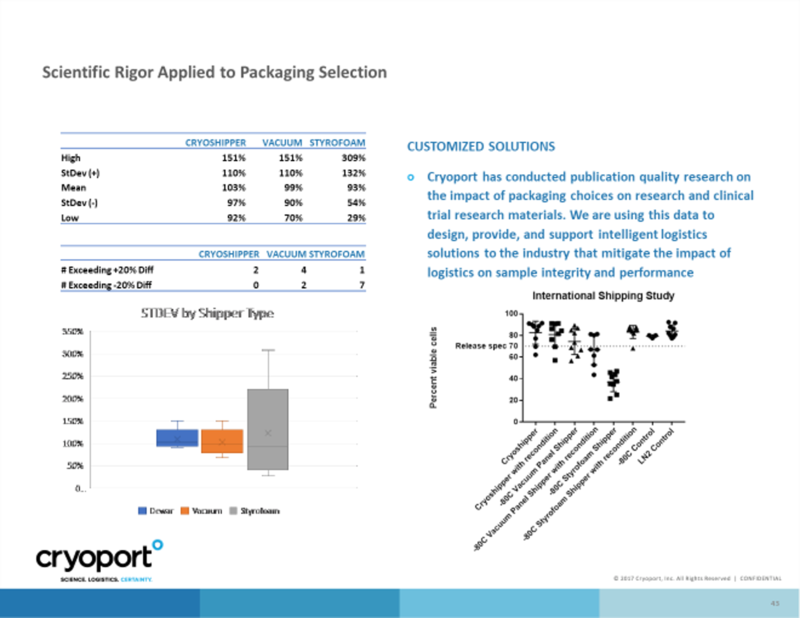 The comparison reveals that packaging and cold chain logistics decisions directly impact the quality and viability of the cells being transported. The sublimation of dry ice allows for thermal variances that increase as the duration of transit increases. Dry Ice releases a large volume of carbon dioxide gas as it sublimates. Airlines restrict the quantities allowed on aircraft causing potential for shipping delays. Dry Ice sublimation creates empty space inside of the packaging allowing for movement and shifting of contents that can result in damage to primary containment of the cells (broken vials). The pH impact of dry ice on cells is in proportional to the duration of shipment transit time. Dry Ice Sublimation also allows for an increasing air space relative to the amount of time in transit. This creates pockets of warmer air and causes products to experience thermal cycling in temperature ranging from Ambient to -70c with a median range of -20c to -50c, some cells will die because of the temperature fluctuation. While considering the advantages of cryogenic liquid nitrogen (LN2) dry vapor shippers that are used by both of the only FDA approved immunotherapies (Novartis’ Kymriah™, Gileads’ Yescarta™) the comparative advantages vs. dry ice are significant. Cryogenic temperatures of LN2 dry vapor shippers significantly reduces thermal cycling during transport. LN2 dry vapor shippers are nonhazardous and have an exemption for transport, IATA special provision A152. Clinical efficacy, cell viability, bioanalytical and manufacturing issues encountered may in fact be logistics issues. Cryogenic transportation significantly improves the viability of cells when compared to dry ice. LN2 dry vapor shippers do not affect pH levels of cells..
LN2 dry vapor shippers are reusable making them a "Green" solution reducing the carbon footprint of the user. The graduating class of 2018 needs to bring the research skills up to the level that supports the valuable studies they will be conducting in the life sciences. It is up to them to make the choice of how transporting cells will be done in the future. The success of Personalized Medicine is a good indication of where these choices are going and it proves that LN2 dry vapor shippers and cryogenic and temperature-controlled logistics can be a superior solution for living cells. Read our blog for the latest news on cold chain logistics issues.